Thinly slice the cooked octopus and set aside. Peel and dice boiled potatoes.Transfer potatoes to food processor with heavy cream and butter, blending until smooth. Season with salt, pepper, and freshly grated nutmeg to taste. In a small saucepan, heat the sugar, salt, rice vinegar, and mirin until sugar and salt are completely dissolved. In a bowl, sprinkle the warm, cooked sushi rice with the vinegar mixture and stir gently with a rubber spatula. Cover with a damp kitchen towel while preparing the sushi, letting it come to room temperature. Peel and grate ginger and set aside. Cut the dried seaweed sheets into squares. 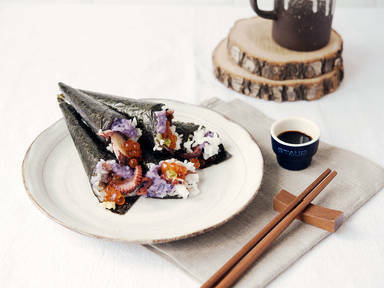 Place a tablespoon of sushi rice in the middle of a sheet of dried seaweed. Add a teaspoon of the mashed purple potatoes, a slice of the octopus, and half a teaspoon of salmon roe. Add wasabi, plum sauce, soy sauce, and freshly grated ginger to taste. Roll the seaweed into a cone. Enjoy!